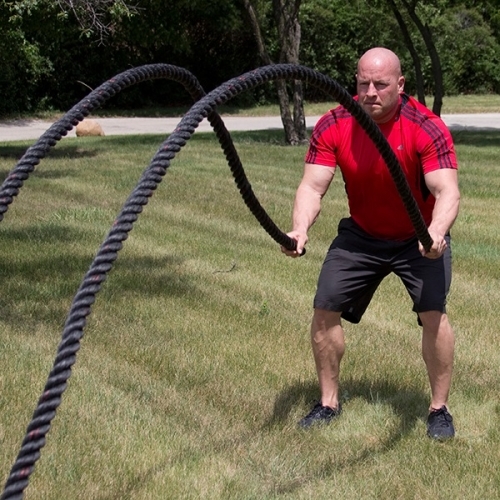 Unlike those flimsy infomercial contraptions or expensive home workout machines, heavy rope training requires just one sturdy, low-cost piece of equipment – rope. Don’t have one? No problem. 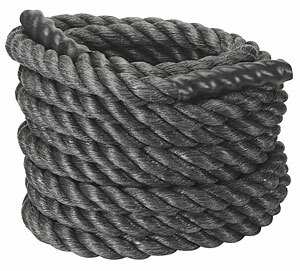 Just go to FitnessZone.com today and get yourself the rope that best suits your needs (1.5 to 2 inches in thickness). Body-Solid is the best because it’s sturdy, durable, and will stand up to the weekly pounding you put it through. So, what are “Battling Ropes”? They are a single heavy rope used as a strengthening and conditioning tool for successfully achieving multiple training goals. 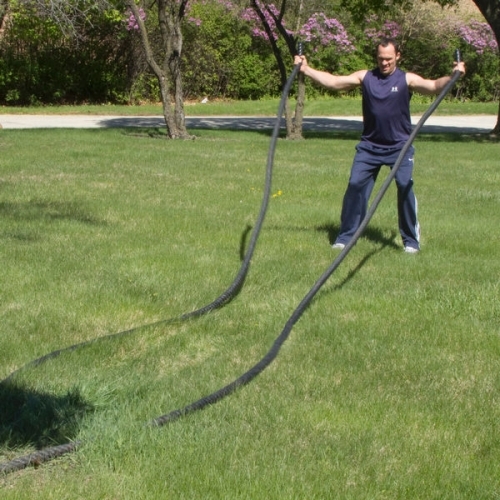 The official “Battling Ropes System” was developed by John Brookfield, who has created many training methods used by strength and conditioning coaches. John Brookfield has written several books, and is the world record holder for grip strength, most recently known for the amazing feat of pulling trucks with nothing more than chains, bare strength and determination. 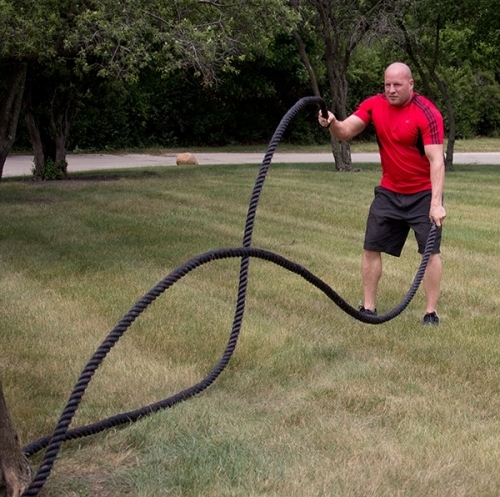 Battling Ropes or heavy rope training gives the entire body countless benefits. The great thing about training with the Battling Ropes is that movements and techniques can be modified for exercisers of just about any fitness level; from using both hands to grip and work only one end of the rope, to adding more advanced movements that include lower body movements along with the upper body work. Battling Ropes training provides a form of higher intensity training without the impact on the joints, specifically in the lower body as in jumping or running. Though the upper body is obviously engaged throughout the movements, the hips and legs are engaged as well, helping to stabilize the trunk or core of the body with a solid stance. The movement at the hip joint and trunk will also help to create the power of the rope movements. A combination of muscular endurance and strength is developed, as well as cardiovascular conditioning, grip strength, explosive power, joint stability, and core strength and stability. Heavy ropes work the entire body; shoulders, arms, back, muscles around the spine, the low back, abdominals, chest, hips and legs. 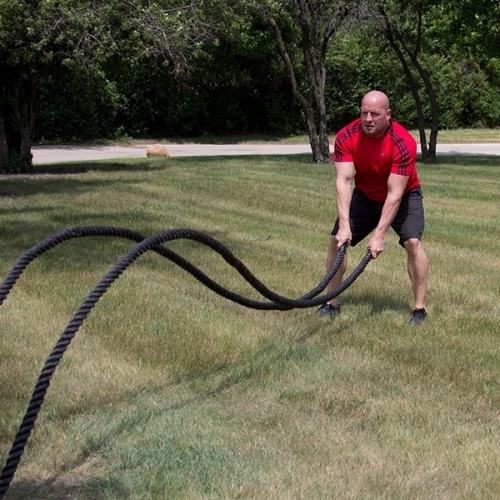 Battling Ropes training is great for conditioning the mind as well as the body. Having to endure such an intense workout of continuous form and speed of movement, makes it powerful training for mental toughness. Also, by adding lower body movements along with the upper body work, you can build the complexity of the exercises for a different type of mental challenge. Multiple muscle group activation makes it an excellent way to burn fat, activate the deep core muscles in the body, challenge the mind, and though it is a tough workout, the basics are simple to learn. BSTBR1530: 1.5" Dia. | 30 Ft. Rope | 13 lbs. BSTBR1540: 1.5" Dia. 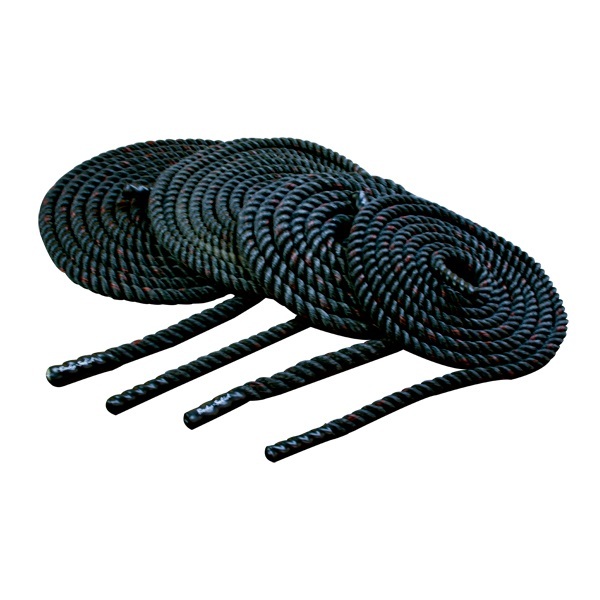 | 40 Ft. Rope | 19 lbs. BSTBR1550: 1.5" Dia. | 50 Ft. Rope | 22 lbs. BSTBR2030: 2" Dia. | 30 Ft. Rope | 20 lbs. BSTBR2040: 2" Dia. | 40 Ft. Rope | 29 lbs. BSTBR2050: 2" Dia. 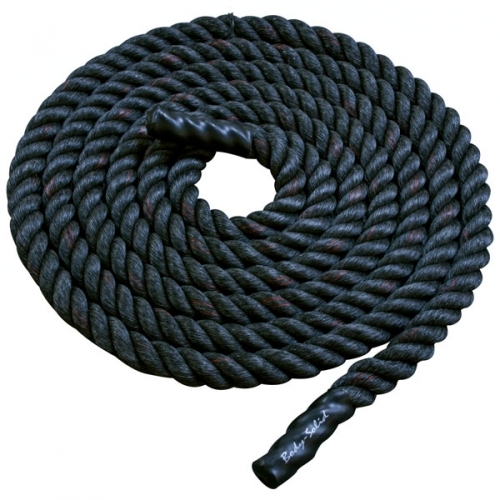 | 50 Ft. Rope | 34 lbs.